Cranes are a family, Gruidae, of large, long-legged and long-necked birds in the order Gruiformes. 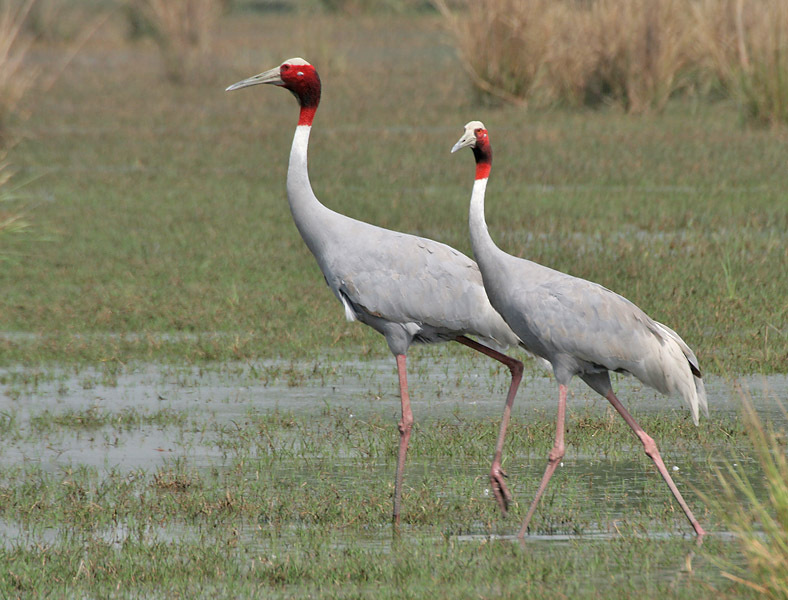 There are fifteen species of crane in four genera. Unlike the similar-looking but unrelated herons, cranes fly with necks outstretched, not pulled back. Cranes live on all continents except Antarctica and South America. Most have elaborate and noisy courting displays or "dances". While folklore often states that cranes mate for life, recent scientific research indicates that these birds do change mates over the course of their lifetimes (Hayes 2005), which may last several decades. Cranes construct platform nests in shallow water, and typically lay two eggs at a time. Both parents help to rear the young, which remain with them until the next breeding season. The plumage of the cranes varies by habitat. 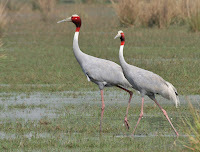 Species inhabiting vast open wetlands tend to have more white in the plumage than do species that inhabit smaller wetlands or forested habitats, which tend to be more grey. These white species are also generally larger. The smaller size and colour of the forest species is thought to help them maintain a less conspicuous profile while nesting; two of these species (the Common and Sandhill Cranes) also daub their feathers with mud to further hide while nesting. Most species of crane have some areas of bare skin on the face, the only two exceptions are the Blue and Demoiselle Cranes. This skin is used in communication with other cranes, and can be expanded by contracting and relaxing muscles, and change the intensity of colour. Feathers on the head can be moved and erected in the Blue, Wattled and Demoiselle Cranes for signalling as well. Also important to communication is the position and length of the trachea. In the two crowned-cranes the trachea is shorter and only slightly impressed upon the bone of the sternum, whereas the trachea of the other species is longer and penetrates the sternum. In some species the entire sternum is fused to the bony plates of the trachea, and this helps amplify the crane's calls, allowing them to carry for several kilometres.